I'm working on the process of creating interesting spiral lentil beads from scrap clay.﻿ The fact that they are made from scrap clay makes them difficult to control and therefore difficult to reproduce. I've been working on a technique - actually, I've noticed that I have a way of working with scrap clay that gives me specific results, results I really enjoy. Ergo, I've been paying better attention to what it is that I do when I work with scrap clay. I have a real problem using up scrap clay as, well, as scrap! When I start mixing up the scrap I go through stages where it surprises me with the beautiful, serendipidous juxtaposition of colours and patterns that appear. I have been known to tuck the sheet away when it gets to a particularly gorgeous state or to bake it up as colour studies for future work both in clay and in painting. Baked colour inspiration, both sides. Because of this, contrary to many clay artists, I have a serious lack of scrap clay. I'm at the stage where I really hesitate to touch it for fear of using up bits that would contribute to the next batch of unexpected beauty!!! Yes, I know, crazy, right? 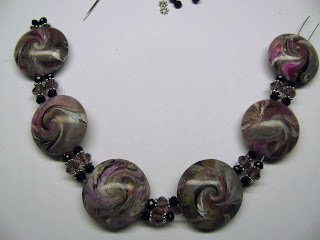 The silk purse necklace, previously posted, and now this silk purse bracelet were both made from two different (but related) batches of scrap clay. So I'm now starting to understand how to control this wild process and even how to make sure I get certain effects that I specifically want. Study the Silk Purse Bracelet beads below and tomorrow we'll talk about one of the most important elements of design for impact.